What Happened to the VHS '70s Show? In March and April of this year, the Vermont Historical Society in Barre hosted a series of community forums on the influence of 1970s counterculture on the state — and vice versa. These gatherings, which Kevin J. Kelley wrote about in March, marked the early stages of a VHS research project called "1970s Counterculture and Its Lasting Influence," funded in part through a grant from the Institute of Museum and Library Services. As 2015 comes to a close, VHS curator Jackie Calder says the project is "moving along," though she notes that collecting oral histories is taking a little longer than anticipated. Through the efforts of Calder, VHS public program coordinator Amanda Gustin and two hired interviewers, approximately 50 oral histories have been gathered so far. Most of the subjects are individuals who came to Vermont as young adults and are now sixty- to eightysomething. For interviewee selection, VHS has used the snowball method. "It's all connection and leads," Calder says. "We never know where it's going." One surprising discovery, she notes, is the relationship between the influx of liberally minded youth in Vermont and advances in community health care. Calder cites a loose operation called the Free Vermont Traveling Medicine Show, which evolved into the Burlington Free People's Clinic — and eventually into the Community Health Centers of Burlington. She also mentions the Home Health Handbook, a lo-fi collection of basic health care information that got a "pretty good" review in the New England Journal of Medicine. Not all the relics the VHS has turned up are positive. Calder references the "hippie scare" in the spring of 1971, an outburst caused in large part by a newspaper article that claimed 50,000 young people were coming to take over Vermont. 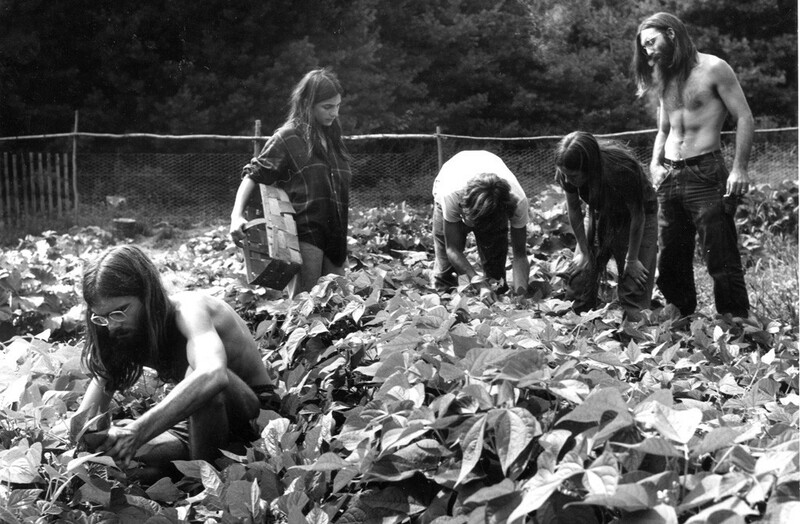 The Earth Peoples Park in Norton was perhaps the most notorious example of a so-called "hippie invasion." The 55 acres near the Canadian border were purchased by a California commune in '71 and touted as a free space, without owners or rules — what Calder refers to as "essentially a free land situation." State archives from that time are rife with evidence of Vermonters' anxiety about their changing home. Calder points to a "wonderful folder" of letters to then-governor Deane C. Davis, which plead for or demand reprieve from the threat of so many "progressive" newcomers. One Derby resident's handwritten note charges, "Any intelligent person can tell by their looks that this trash are not Vermonters and that they are Communist trained." Finding people to speak about negative experiences of Vermont's counterculture has been a challenge, however. Calder says that while VHS has found indications of such reactions on surveys, the respondents remained anonymous. "Everybody has their own story; that's the other thing we're finding out," says Calder. While each newcomer to Vermont in the '70s had individual motives, she concedes that, for the most part, the pilgrims were "white, middle-class and very well educated." Among their occupations: teacher, social worker, entrepreneur and medical professional. Calder adds, "No matter what they did, they really remained committed to their ideology. A lot of people are still living very simply." The fruits of VHS' labor will culminate in an exhibition and symposium in the fall of 2016. Calder or Gustin will likely assemble a book of their findings. That won't be the last word on the subject. Calder suggests that the primary goal of the project is to "collect the information and have it in a central place" where it will be available to future researchers. Next fall's events will just show the "tip of the iceberg" that VHS is uncovering. "You never really finish a project like this," Calder says. The original print version of this article was headlined "Hippie Invasion: What Happened to That '70s Show?"